Has Education arrived in the 21st Century yet? 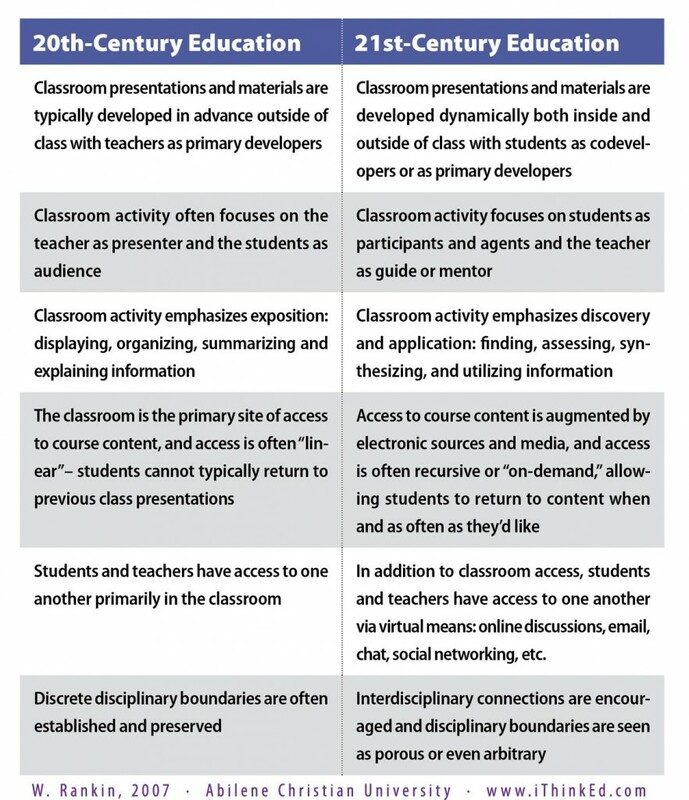 This interesting table, comparing 20th and 21st Century learning, was conceived by William Rankin, a well credentialed doctor of Education from ACU, Texas. This graphic, which I found on Educational Technology and Mobile Learning, was originally published on iThinkEd in 2007, where you can read Rankin’s full thoughts that led to his creation of this table. What’s fascinating for me is the fact this was written 7 years ago. It doesn’t date the message. It challenges us as educators to reflect on how far we have actually progressed. I started hearing the talk about 21st Century Learning back in the 90s and here we are in 2013 and, looking at this chart from Rankin, we have to ask ourselves; for all the talk and planning, have we really moved out of the 20th Century and embraced what this nebulous concept of 21st Century is really about? We marvel at the innovators we love watching on TEDTalk videos. We build our great contemporary learning spaces. We create our visionary policies and curriculum documents. And yet, if we take the comparisons Rankin presents here at face value and accept his point of view, we probably have to admit we are still struggling with the ‘Education Revolution’. Are we as teachers still in the 20th Century and pre-conceiving and preparing all the content the students need? Do we still spend most of our time sourcing all the resources and learning materials needed for the learning experiences in our schools or are we handing that responsibility over to the students so we have time to think about how we can teach them? Do we see learning as a dynamic experience that needs the students to be actively involved in or are we still doing all the preparing and thus not allowing for individual interests? Is any of this our fault or is it caused by the demands of Education departments prescribing a set curriculum we have to cover and then get assessed on by standardised tests that students and teachers have no control over? Can we promote 21st Century LEarning in this environment? What does it look like at your school? Despite open, collaborative spaces are teachers still front and centre at the whiteboard ( interactive of not) in control of the conversation and the learning time while students passively listen and respond? Have teachers old and new had sufficient training in how to get their students to become participants and agents while they guide and mentor them? Are our students prepared to take on that challenge or do they still have it engrained in them through current societal/familial expectations that it is still up to the teacher to do all the work as the status quo has been for so long? Are we expecting too much of young minds to know what they want to learn? Do we still place emphasis on displaying, organising, summarising and explaining because it is a more visible form of learning, easier to assess and present to parents and administrators, and more closely linked to standardised tests that ‘verify success’? Do we know when our students are actually ready and capable of finding, assessing, synthesising and utilising information? Do we know how to assess how well they are achieving these skills? Are we sufficiently trained in teaching students how to use these skills? Do students and parents (teachers?) value these higher level skills as much as the easier to identify/rank/reward 20th century skills? Are we still putting most of our classroom learning on temporary/inaccessible materials like sheets of paper and wipeable boards because its easier to do? Why do we throw out/store/hide so much of the recorded learning in a grade when 21st Century theory stresses the importance of students having access to content at any time? Will entire education systems ( not just clusters of well resourced schools) ever reach a time when everyone really has enough access to technology that allows for the ‘on demand’ access to content 21st C Learning expects? How many teachers are sufficiently aware of the technology available that can provide this access and how can we train them so they see it is easy to do and beneficial? Is it socially acceptable yet in the eyes of society and current laws for students and teachers to have regular online contact with each other, given the the way social media is portrayed? Is it realistic or even fair to expect teachers to be available 24/7 for students to seek their assistance? Are we not allowed to have private time like every other occupation? How well versed in digital citizenship are both teachers and students in order to use social media responsibly and effectively? Are Education departments even close to ready for this to become a norm in our way of teaching? Why are we still set in our ways in boxing learning into Literacy blocks, Numeracy hours, Computer classes, Art electives and Inquiry time? How long will it take to make learning truly integrated like life in general is? If we believe in collaborative learning, can we ever get the Maths teacher, the English teacher, the History Teacher and the Science teacher all together in the same collaborative learning space working on the same project with all of their disciplines intertwined into the same task with them contributing their special knowledge skills as a cohesive unit? Do we even know if that is possible? Is it possible in a climate that is perceived as controlled by isolated pockets of narrow testing regimes that don’t assess collaborative interdisciplinary learning? Now I’d be kidding myself if I could achieve all that I ask here. But if you accept the vision of 21st Century Learning presented by Rankin here, is this not what is being asked of us. I consider myself to be a decent 21st Century teacher. I love sitting back in the lounge room at night with laptop or iPad in hand giving feedback to students on Edmodo. I do my utmost to get content online so students can access it at all times so they have some support when they need it and can reflect on learning achieved in class during the day. I ask the big questions that encourage them to go beyond recording information. I am surrounded by technology and have a love of using it. But it’s not fair to expect that of everyone and its unrealistic to expect everyone to have access to the same resources. School systems aren’t sufficiently resourced in the expensive equipment ( neither are all homes), large numbers of teachers both new and experienced aren’t sufficiently trained. We are well into the second decade of the 21st century. We still have a lot of catching up to do. 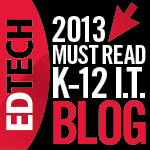 How do you see the current state of education in terms of the 21st Century Learning/Education revolution debate? Are schools achieving the goal as a whole or are we still just seeing pockets of change from individuals or small groups? Is it too much to expect 21st Century Education to have arrived just because we are in the 21st Century? How close are we to the dream? Join the conversation.